On this day, the bugle sounded reveille at 3:00am and the regiment started a march to Brashear City (now Morgan City), Louisiana. They arrived at Brashear City at noon, having marched about seven miles in extreme heat and an intense sun. After resting during the afternoon, the troops set up tents, making their camp on the shore or Berwick Bay. They were now 80 miles west of New Orleans. The regiment would stay here for two weeks. 1863 map (portion) showing the route of the 16th Ohio from Bayou Boeuf to Brashear City, Louisiana, where they would camp for two weeks. 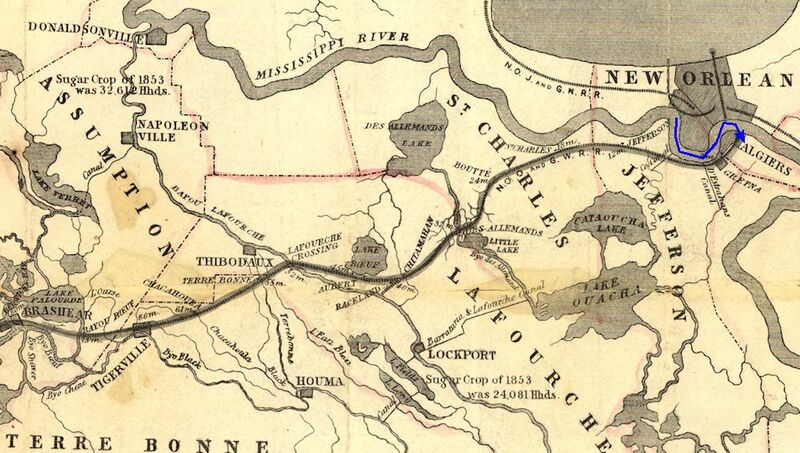 Note: It is highly likely the railroad that transported the regiment west was the New Orleans, Opelousas and Great Western. 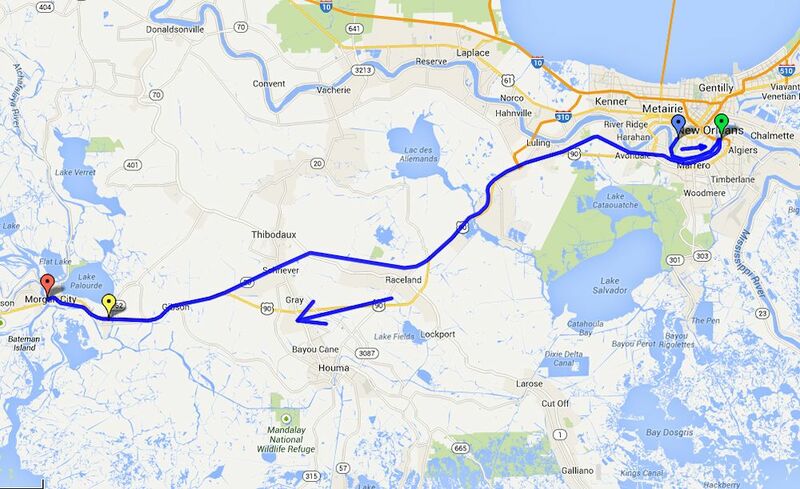 Modern day map showing the approximate route of the 16th Ohio's march from their campsite at Bayou Boeuf to Brashear City, Louisiana, on September 11, 1863. Blue pin - Approximate location of the campsite of the 16th Ohio in Carrollton, Louisiana, August 15 to September 6, 1863. Green pin - Algiers, Louisiana, where the 16th Ohio boarded a train headed west to Brashear City (now Morgan City), Louisiana, at 4:00pm on September 6, 1863. 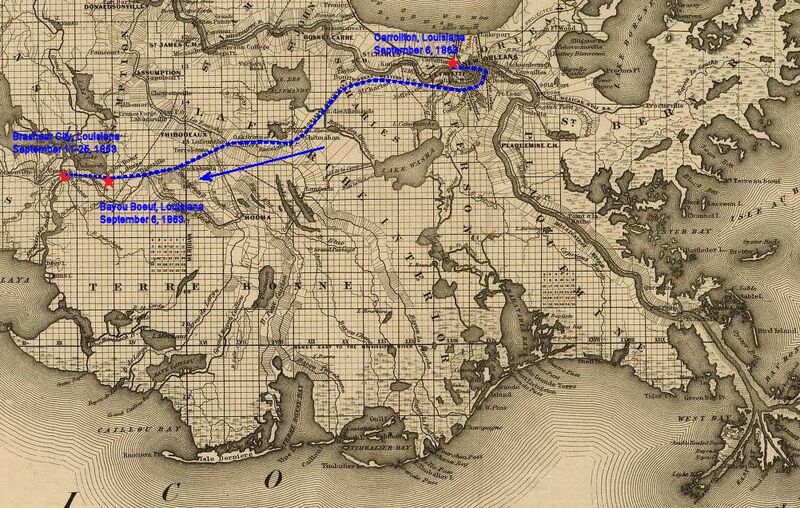 Yellow pin - Approximate location of the campsite of the 16th Ohio at Bayou Boeuf (present day Amelia) where they arrived on a train, late at night on September 6 (or morning of the 7th), and stayed until the morning of September 11, 1863. Red pin - Approximate location of the campsite of the 16th Ohio at Brashear City (present day Morgan City), Louisiana, where they arrived at noon on September 11, after a seven mile march from Bayou Boeuf. The regiment camped here until the morning of September 25, 1863.